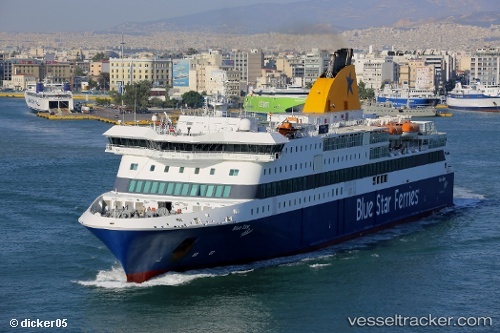 On Sep 6, around 7 p.m. the “Blue Star Patmos” was finally pulled off the rocks off Ios. Earlier, specialized divers had carried out a new survey on the ship’s hull, and minor sealing work was done. From now on the insurance companies, which have taken over the whole business, will have to re-inspect with special crews to assess the condition and magnitude of the damage. The ship was held near the grounding site by the tugs “Christos XI”, “Christos XXII” and “Pantokrator” for surveys before allowed to be pulled to the port of Ios in order to unload the trucks and the vehicles and then, after some repairs, it will be taken to a yard for docking, possibly in Peraia.